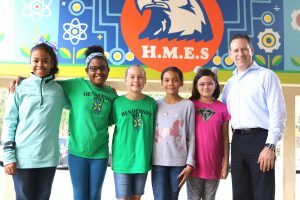 Henderson Mill Elementary hosted its second annual essay contest in January and February 2018. 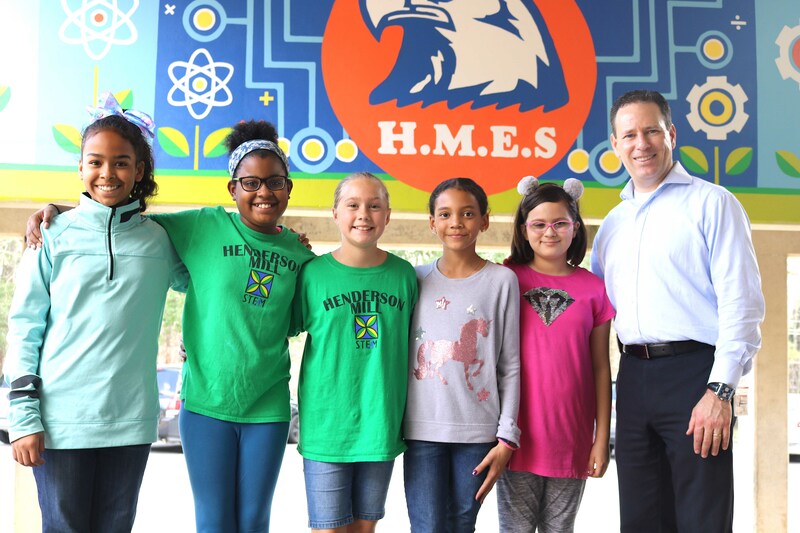 The contest is a byproduct of a partnership between Henderson Mill and Hormel Foods, Inc., who together seek to enrich the perspectives of students. This year’s winner, Madison Tahtinen, said Dr. King means many things to her, but primarily freedom, confidence, perseverance and bravery. Her essay focused on Dr. King’s “I Have a Dream” speech, which outlined a future in which black and white American citizens live in harmony. “When I think of Dr. King and his great character traits, that’s what I think of,” Tahtinen said. Tahtinen and four other finalists—Isadri Hernandez, Meghan Robinson, Sadie McMillen, Cori Cole—were honored with a visit from Hormel Foods employees at a Henderson Mill Variety Show held in mid-February. Finalists were honored with official certificates and gift card prizes. McMillen called Dr. King a symbol of bravery and justice. She said she liked being able to express herself about the Civil Rights leader and was honored to have him as an essay topic. Robinson’s essay focused on her admiration for Dr. King and what he stood for as a leader. She acknowledged that through his actions, she is able to have plenty of options in her life. Cole called Dr. King “an important part of everything, really,” and said he helped peoples’ lives for the better. She said she enjoyed researching Dr. King, as she was able to learn more about him than what’s covered in a typical class lesson. Hernandez focused on Dr. King’s wisdom and leadership abilities. Tahtinen’s essay was forwarded to Hormel’s home office in Minnesota, where it will be considered for a grand prize. Should her essay be chosen, the Henderson Mill fifth grader will receive an all-expenses paid trip and tour of the company’s facility. Language arts teacher Ebony Jones praised the students’ essays for relating to their own lives. Fifth grade teacher Gayle Bradshaw said students enjoy the essay contest each year because they realize how important Martin Luther King, Jr. is to the world at large. Principal Mitch Green said the students’ focus on tolerance in each of their essays is commendable. He said the students’ celebration of diversity and acknowledgement of what was necessary to achieve it is one factor that makes education at Henderson Mill unique. Green said the annual contest is a great way to show students that the surrounding community is cheering on their education and providing support. Hormel is one of Henderson Mill’s chief STEM (science, technology, engineering and mathematics) community partners. The school and the company’s Tucker office frequently work together on STEM nights, expert visitations to the school and more.